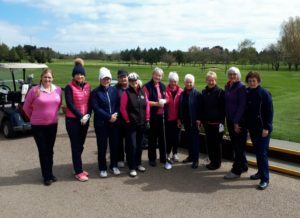 On Thursday 11th April, Melton Ladies hosted their first friendly match of the season with a visit from Greetham Valley Golf Club. Four fourballs set off in the sunshine on a glorious day with a long run on the ball and the greens playing true. All the matches were hotly contested, with two being decided on the 18th. Greetham won by a small margin: 2 1/2 to 1 1/2 with Lady Captain Nancy Denny and Bettyne Norton carding the only win 5 and 4 and Liz Snow and Cheryl Osbourne coming in with a well deserved draw for the half.